Although his beard is the requisite shade of white, Warren Haynes would need another 10 inches or so of growth to be mistaken for Santa Claus. Nevertheless, the Grammy-winning frontman of southern rock jam outfit Gov’t Mule and former guitarist for The Allman Brothers Band has become as essential to Christmas in Asheville as old St. Nick himself. The lineup itself is a gift to music lovers of all types, featuring Gov’t Mule as well as Trey Anastasio & Classic TAB, The Avett Brothers, Les Bros. and Blackberry Smoke. The Citizen-Times caught up with Haynes through a phone interview in the busy run-up before the Christmas Jam to learn more about the history of the event, his approach to recruiting musicians, and his thoughts on the new Gov’t Mule album "Revolution Come… Revolution Go," released earlier this year on Fantasy Records. The Christmas Jam has been running for nearly 30 years — what’s been the most surprising part of how the event has evolved? It’s all been a surprise! The Jam started organically as a way for all of the local musicians to play together at the one time of the year when it seemed like everybody was in town, which was the Christmas holiday. I love how it grew on its own from being a local event to a regional, then national and international event. There’s something about musicians playing for a worthy cause that creates magical music — it reminds us all why we started playing in the first place. In its early stages, the Christmas Jam benefited a different charity each year. How did you settle on Asheville Area Habitat for Humanity, which you’ve supported since 1988? I love the idea of building houses for people that can’t afford homes. With a lot of charities, you just have to assume that the money’s all going where it’s supposed to go, but with Habitat, you can actually see things being built. You know how many houses you’re contributing to and how many have been built through the years. And at our volunteer event, Before the Jam, Lend a Hand (set for Dec. 8 this year), it’s beautiful to see everybody working together and contributing to the process. You’ve talked about wanting to give back to the community that played a formative role in your upbringing. What’s the most important thing you took from growing up in Asheville? In a lot of ways, Asheville was an ideal place for a child to grow up: People here are really friendly, and the countryside is beautiful. For someone like me who loved music and wanted to play music as a career, Asheville has always had a cool music scene with a lot of different kinds of music being played, both traditional and progressive. That interest in musical variety shows in the Christmas Jam lineup. How do you determine who plays at the event? We start reaching out to people around April. My criteria for picking artists have always had a lot to do with my personal taste. I love all types of music — I think it’s very important to maintain the diversity year after year. It’d get a little monotonous if it were all the same genre from 7 to 2 in the morning! The music reflects the attitude of the event, which is really about open-mindedness. It caters to people that choose to have music as a big part of their lives. What lesser-known artists are you particularly eager to feature this year? I’m excited to share the stage with Jake Shimabukuro, who has never appeared before at a Christmas Jam. I think Margo Price being on the bill will be a nice bonus because she was added after the show had already sold out. And Brandon Niederauer (who's 14) is probably the youngest artist to be a part of the show; he was one of the stars of “School of Rock” on Broadway, but now he’s moving on to do his own thing. His spirit is great, and he’s a wonderful musician that’s just improving constantly. 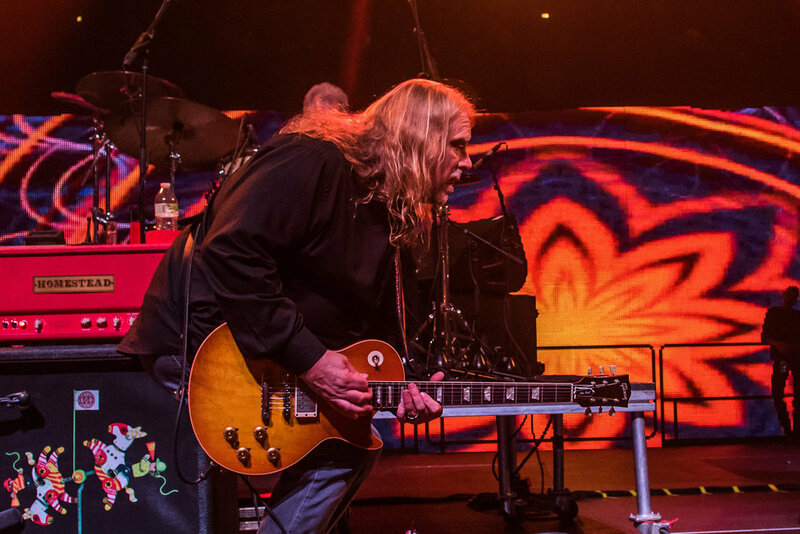 Gov’t Mule’s set will feature material from the new album "Revolution Come… Revolution Go," recorded just after last year’s elections. How did those events influence the music? I just tend to write about whatever’s going on around me, and during that time period, the divide that’s going on in America seemed to be unavoidable. The handful of songs on the new record that have political connotations are more from a spectator’s point of view. Some of them have a kind of '60s outlook of trying to work together and move things forward in a grassroots effort. I think people have to make it better — if we’re expecting politicians to make it better, that’s probably not going to happen. What are your future plans for Gov’t Mule and your solo work? "Revolution Come… Revolution Go" was the first Gov’t Mule studio album since our 20th anniversary, and we feel like we’re embarking on a brand-new chapter. We’ll keep promoting the album well into next year, and I hope we get to schedule another show somewhere in the area soon. It’s going to be a while before I get back into the studio, and at this point, there’s no indicator as to whether it’s going to be Gov't Mule or some sort of other project.